I’ve always enjoyed visiting gardens where Koi ponds are a focal point. The fish swimming serenely in a natural, beautifully-designed setting bring serenity to me, too. As an artist, I love the contrast of orange & white against the deep blue water & dramatic black shadows. While my ancestral traditions harken back to central & eastern Europe, I can appreciate Asian cultures & the contemplative nature of their gardens & meditative spaces. Nature & spirituality are one. 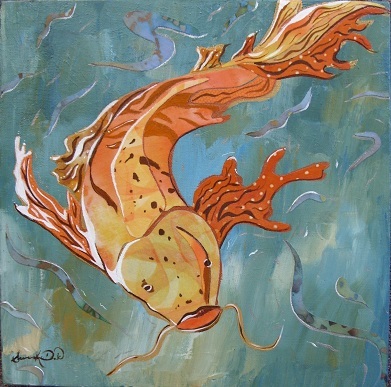 After completing this piece, I found out as much as I could about Koi. Various sources say it is a symbol of perseverance, endurance, & longevity. Others say it symbolizes love, affection, peace, courage, & tranquility. All consider it a positive symbol of qualities we’d all like to have in our lives. May those qualities already be present in yours. This entry was posted in A Window on Life, Art and Soul, My Love for Nature and tagged art, Asian, beauty, collage, earth, fish, Koi, meditation, nature, spirituality by puresusan. Bookmark the permalink. Thank you! It’s always fun to make a piece that goes in a different direction than I intended. Keeps the work exciting & reminds me that inspiration comes in its own time.